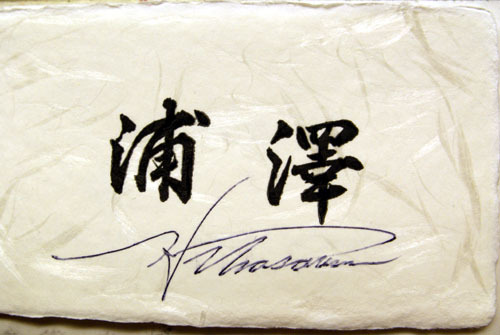 This post documents my fifth visit to Urasawa, which was actually gratis to me, thanks to a little bet I "won" from a friend and former colleague of mine (thanks James!). As such, I'll skip the pleasantries and get right into the amazing experience that is Urasawa. As usual, I booked the entire bar (10 persons max), and joining me this time were Ann of Menu Taster, Jasmine & Jeff of Recipe Mama, Ryan of Only Eat What Feeds Your Soul, as well as other non-bloggers. For my previous visits, see March 2009, October 2008, May 2008, and November 2006. Left: Here we see the fish case for the night, which would be nearly emptied by the time we were through with it. Can you identify all the various items? Click for my attempt. 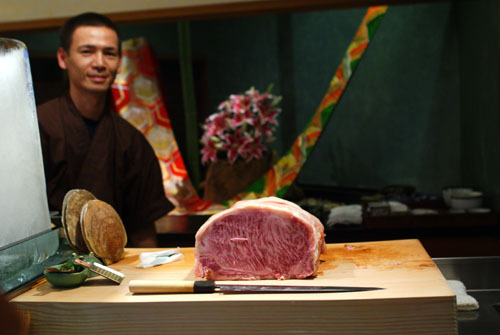 Right: Assistant Ken-san shows off a massive chunk of beautifully-marbled wagyu beef from Kagoshima Prefecture. A rib eye cut perhaps? ...But we also knew that three bottles of bubbly wouldn't be enough to completely wet our whistles. 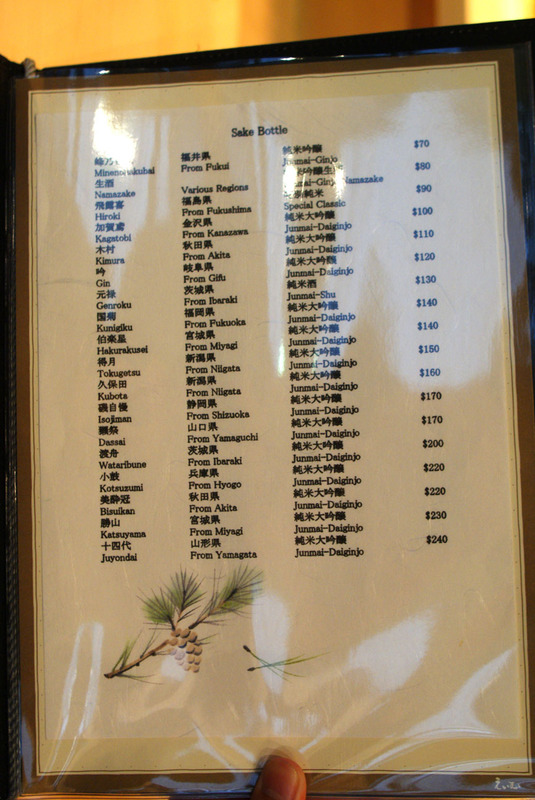 We thus requested to see the drink list, shown above; click for larger versions. 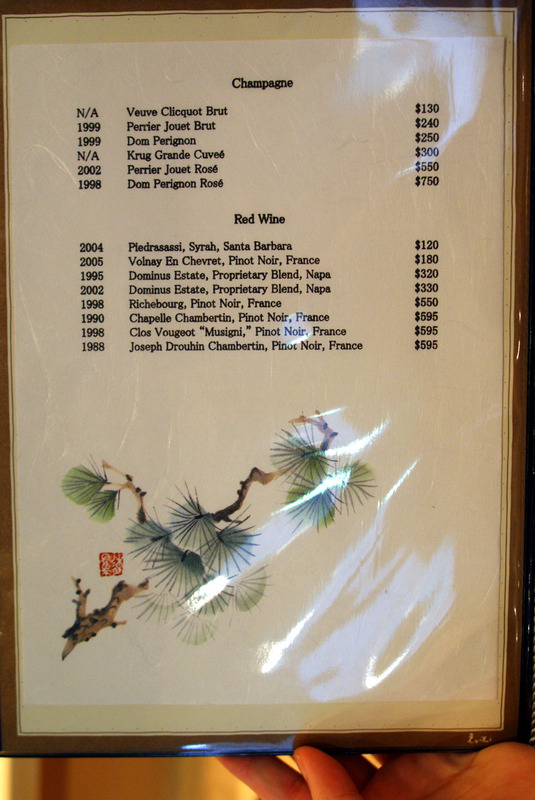 I always appreciate Urasawa's sake list, and on this visit, I noted the addition of two sakes from Miyagi Prefecture: the Hakurakusei Junmai-Daiginjo and the Katsuyama Junmai-Daiginjo. Gone is the Horeki-Daishichi Junmai-Daiginjo from Fukushima, previously the most expensive bottle on the list; that spot is now taken up by the "cult" favorite Juyondai. The note about the "special sake" we had last time was also removed. 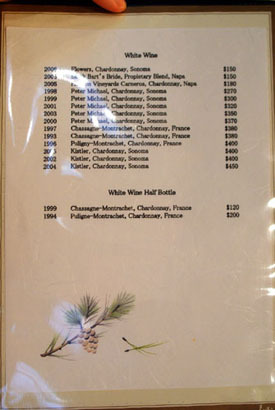 No changes in terms of Champagne or red wine, though there were a couple new Chardonnays from Peter Michael and Kistler. And unfortunately, no new beers, just the "big three" Japanese macrobrews of Asahi, Kirin, and Sapporo (which is why I've never had beer at Urasawa!). I've been liking namazake more and more as of late. 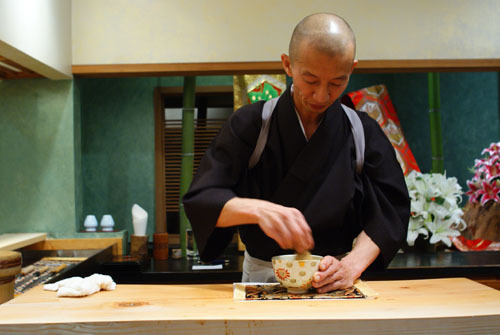 The term refers to unpasteurized sake, which requires refrigeration and has a short shelf life, but which is also greener, more rustic, more in-your-face. The namazake rotates regularly at Urasawa, given that the beverage is somewhat seasonal, and the example tonight was the Watari Bune, Shiboritate Namazake Genshu, Junmai-Ginjo from Ibaraki Prefecture [$80]. Watari Bune is the name of the rice strain used to brew this sake, a varietal that was popular in the early 1900's for its quality, but which fell into obscurity thanks to the rise in prominence of the hardier Yamada Nishiki type. The old school rice was reintroduced by Takaaki Yamauchi of Huchu Homare brewery when he planted some seedlings in 1988, subsequently introducing the Watari Bune brand in 1990. In any case, getting back to the sake at hand, I found it sweet, viscous, and bright, with subtle melon notes and a bit of fire on the finish. Quite refreshing. 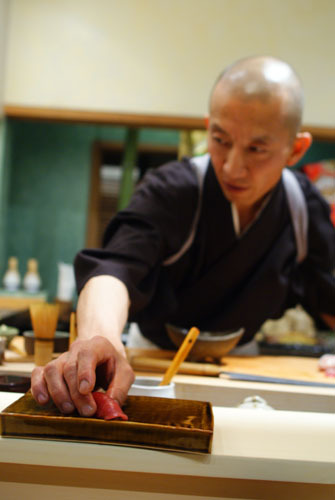 Here we see Hiro-san prepping our first course of the night. 1. Toro Tataki - Hiro-san usually likes to start with a light toro tataki dish, and tonight's iteration had seared toro wrapped around an amalgam of shrimp, uni, and shiso, topped with radish, scallion, and shiso flower, garnished with yuzu juice and skin, soy, vinegar, and sweet sake (mirin). The attack was a mixture of sweet and tangy, a somewhat bracing sensation that eventually gave way to the sweeter, creamier midpalate, thanks to the uni and ebi, no doubt. The finish was flush with citrus and it was here that the flavor of the fish finally came to the fore. The shrimp, meanwhile, provided a pleasing snap and crunch that livened up the dish texturally. 2. Ikura Chawan Mushi - Next up was an egg custard with shiitake mushroom and shiro ebi, covered with ikura and topped with mitsuba and 23-carat gold. Dipping into the silky chawanmushi, I noted a fantastic contrast between the briny, salty roe and the rich, luscious egg custard. 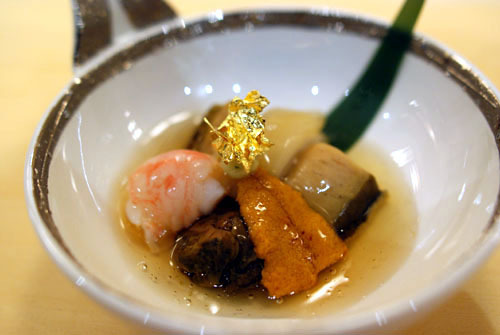 The mitsuba gave the dish a sharp tang while the mushroom and shrimp added a palpable weight and provided a bit of textural variation as well. Very good. 3. Wagyu Tartare - I loved the presentation of this one: a big wooden spoon heaping with chopped wagyu beef, pickled radish, caviar, scallion, and shiso, all topped with uni. A luxurious dish, I first experienced a tangy attack on account of the radish, which really tempered the decadence of the beef. At the same time, the uni acted as a moderating element, while the generous dollop of caviar was relegated to a supporting player. The long, lingering finish was dominated by the admixture of beef and pickles. With our sake dispensed with, it was time to break out the bubbly. First up was the 1996 Moët & Chandon Champagne Cuvée Dom Pérignon Rosé. I'm a sucker for pink, so I reveled in the DP's balanced, subtly sweet commixture of citrus, floral, and mineral notes, along with its fresh, florid, alluring structure--gorgeous. Ken-san helps with the sashimi. 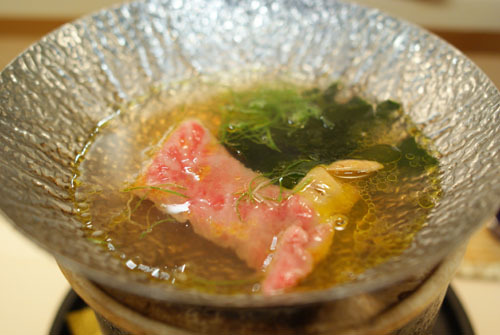 Toro from Boston - This was arguably the best toro sashimi I've had in all my Urasawa visits. It was incredibly unctuous and oozed oil upon chewing, but yet, at the same time, it remained light, delicate in flavor. It was delicious on its own, but even better when balanced by the wasabi and soy. Tai from Kyushu - A clean, crisp cut of snapper, this was textbook tai, with a mild flavor that was good with the wasabi, but superb with the tart red cabbage. 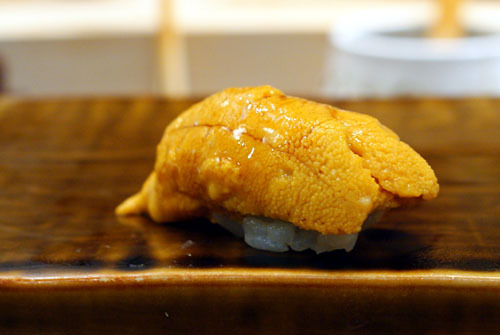 Uni from Hokkaido - Perhaps the perfect uni: unabashedly sweet, yet kissed with the briny essence of the ocean. Even better when paired with the seaweed. 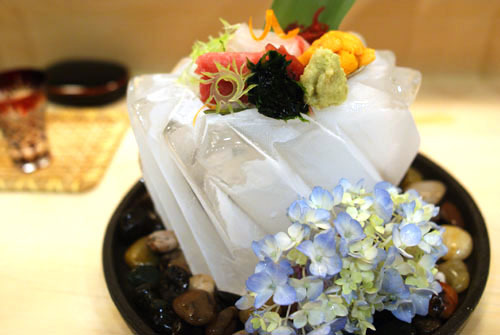 Garnishes include the aforementioned freshly-grated wasabi (from Shizuoka I believe), soy (from Wakayama), red cabbage, and seaweed, as well as carrot, white daikon, and green daikon. The flowers (not sure what type) are usually garnered from local flower markets. 5. 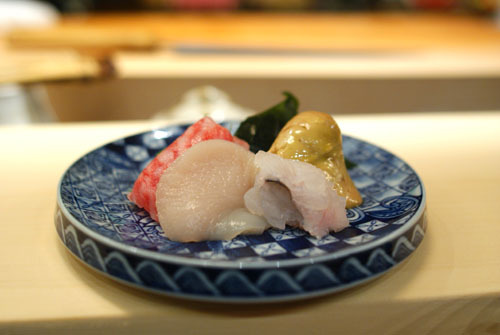 Fukahire-ni-Ichigoni - Ichigoni refers to a type of summer soup, typically made with awabi and uni. The name means "wild strawberries," and refers to the strawberry-esque appearance of cooked sea urchin. Here, we were treated to a more upscale version: served in a tagine-like vessel were abalone from Chiba, shrimp, Japanese shark's fin (fukahire), and the Hokkaido uni. 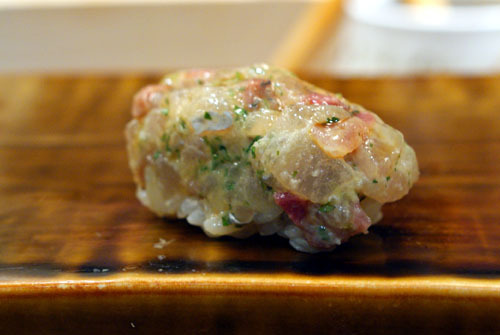 I started with the awabi, which was tender, yet satisfying to chew, with a uniquely gelatinous consistency that wasn't what I was expecting. I then had the abalone entrails, which were sweet and gamy, a stark contrast to the mild flavor of the mollusk's adductor muscle. The shrimp was plump, snappy, and satisfying, but the standout here was the shark fin: gossamer, ethereal, imbued with the flavor of all the other ingredients. It reminded me of why it's considered such a desirable delicacy. 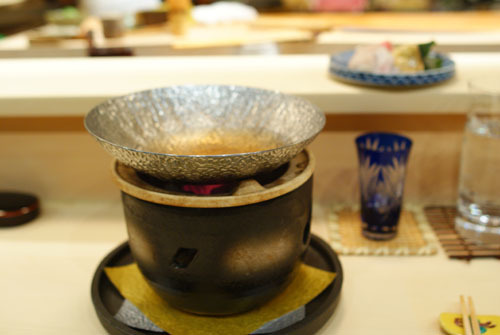 A now, a bit of pyrotechnic action: for the next course, Hiro-san poured sake into our pots, thereby releasing enveloping clouds of steam as the sake evaporated upon contact with the pots' sizzling stones. 6. Sake-Steamed Beef - The pot contained Japanese beef wrapped around shrimp, shiitake, and uni, steamed with sake; it came with an oroshi ponzu (ponzu with daikon radish) dipping sauce. What struck me about the dish was the temperature contrast between hot and cold--the interplay between warm beef and its cool fillings--fantastic. Flavor-wise, the morsels were sweet initially, with the richness of the wagyu coming in afterwards, while the ponzu provided a tart complement. The finish, meanwhile, was uniquely uni-tinged while the ebi did wonders texturally. 7. Anago Tempura - It's hard to go wrong with tempura, and here we had a fine example of anago, or sea/conger eel, from Tokyo Bay (the top spot for eel I'm told). This was actually my first time with anago tempura, and I really appreciated its delicate white flesh, mild flavor, and crispy, savory battered exterior. 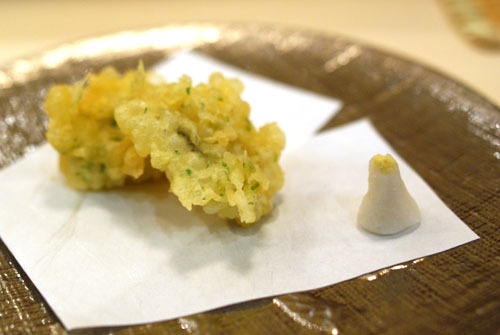 As usual, the tempura was paired with a tentsuyu dipping sauce and a mound of grated daikon and ginger. 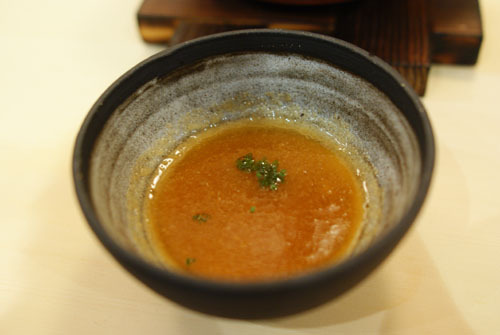 The sauce elevated the dish, adding a sweet/tangy component to the anago that really made for a great pairing. 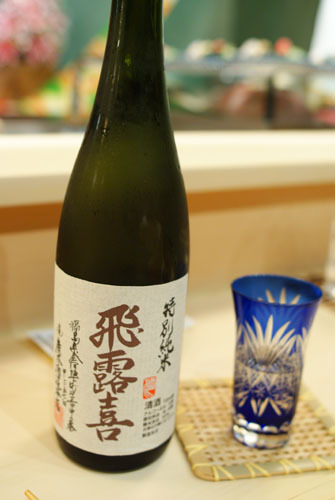 Our second sake was the Hiroki, Special Classic, Tokubetsu Junmai from Fukushima [$90], which I'd had at Hachi previously. 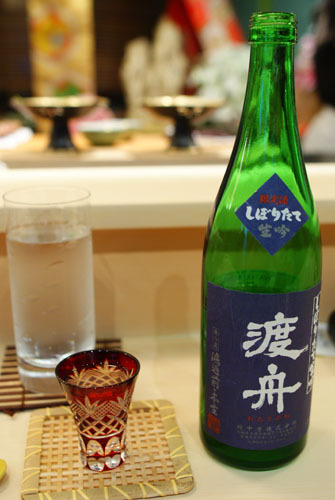 As I understand it, Hiroki is part of a "new school" style of sake that's become very popular as of late. The president of Hiroki Brewing is also its toji (brew master), and interestingly, he's apparently never formally studied sake-making. This gives him an unconventional, unorthodox style that leads to the creation of the bold, distinctive sakes that the company is known for. A 55% seimaibuai sake made from Yamadanishiki, the Hiroki was floral, fruity, light, crisp yet full-bodied, and most importantly, delicious. 8. 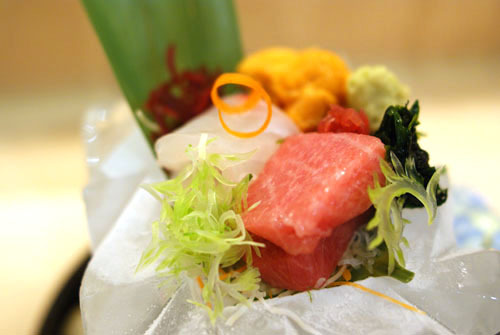 Seared Toro - The stone-seared toro is always one of Urasawa's most highly anticipated courses, and for good reason! Upon touching the stone, the toro released a cloud of rich, savory smoke that whetted our appetites even more. Eating the toro was almost like eating a ridiculously-marbled piece of beef--it pretty much broke apart in my mouth upon mastication. I absolutely adored the unabashedly unctuous consistency of the fish, and how the fat, flesh, and char interacted in my mouth. 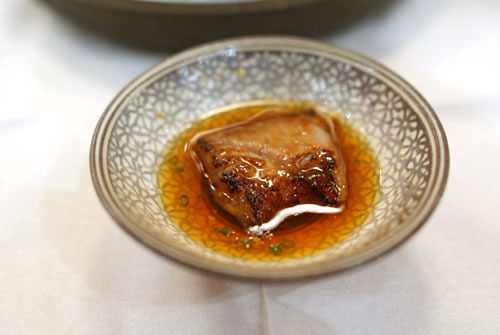 The paired ponzu, meanwhile, did its part in cutting the decadence of the toro, but the fish's sapor lived on in a ridiculously lingering finish. 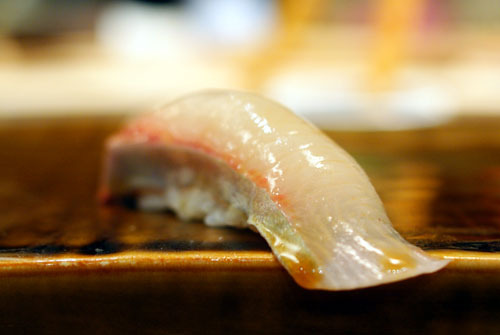 Hamo - The king eel had a surprisingly rich flavor, as well as a soft, spongy texture. It went superbly with the sweet ponzu. 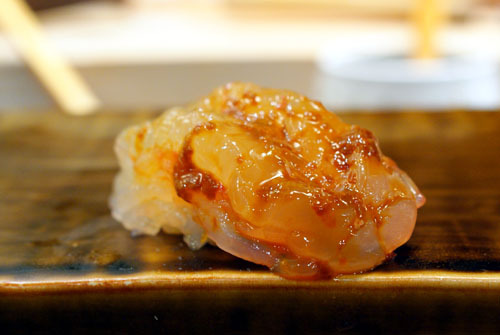 Hotategai - Next to go was the scallop--firm and unconscionably sweet. Kagoshima Wagyu - My favorite of this set, this had the perfect amount of fat, giving the beef an absurdly pleasing texture, and a flavor that was deftly offset by the use of scallion. Foie Gras - Cooked the longest, the foie had a firm, yet yielding texture and a subtle, sublime sapor that just lingered in my mouth. Even James, who wasn't previously a fan of the liver, enjoyed this. Kombu - I made sure to eat the kombu separately this time, and it was some of the best kelp I've had. 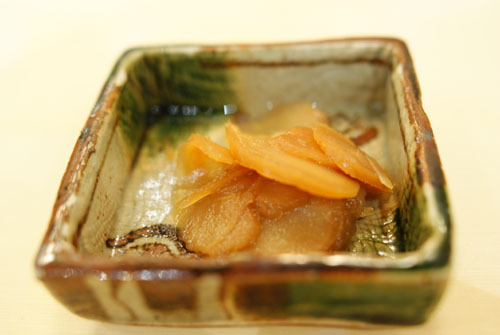 It was from Sendai, Miyagi Prefecture, and possessed a sweet, satisfying smack and a wonderfully crisp consistency. 10. 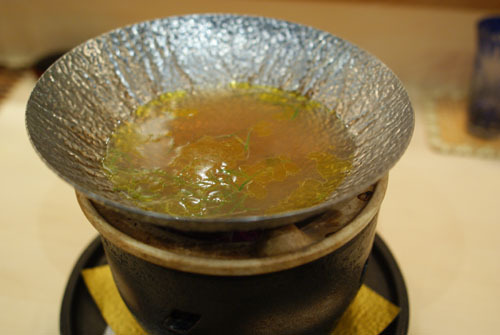 Shabu Shabu Broth - The resultant shabu shabu broth is always a treat to imbibe. The key here is the foie gras; note how the liver's fats are visible on the soup's surface. This provides for a heavy, hearty stock absolutely saturated with the pure essence of foie gras. Yet, it was not overwhelming, thanks in part to the light, vegetal tang of the scallion. And with that, it was time to move on to the sushi portion of the meal. The gari signals the start of the nigiri gauntlet, and Urasawa's is probably the best I've had, with a certain sweetness you won't find in the mass-market variety--this taught me to appreciate ginger. 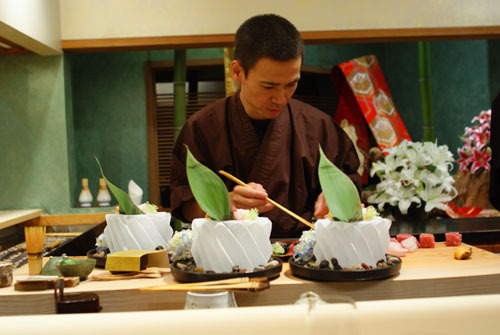 Above, we see Hiro-san crafting and serving the first piece of sushi. 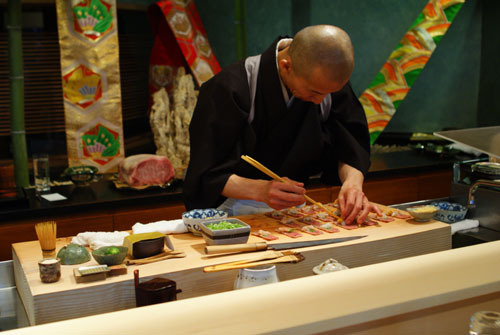 Nigiri is served with all the accoutrements applied already--a brush of soy, a sprinkle of grated sudachi, a splash of yuzu juice--all that's required of the diner is to chew and savor. 11. 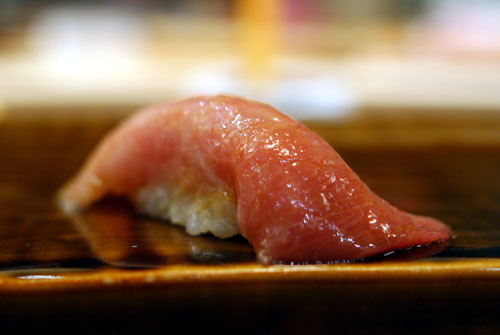 Toro / Fatty Tuna - Unlike at just about every other sushi place, Urasawa's omakase starts with toro, and that's perfectly fine with me. The fish was certainly deserving of the moniker melt-in-your-mouth, enveloping my palate with its luxuriousness. 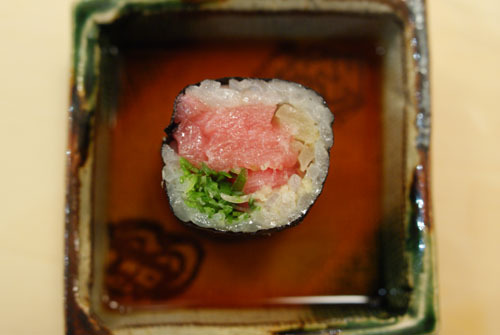 The fat was mitigated by the application of wasabi, resulting in something decadent, yet delicate. Superb. 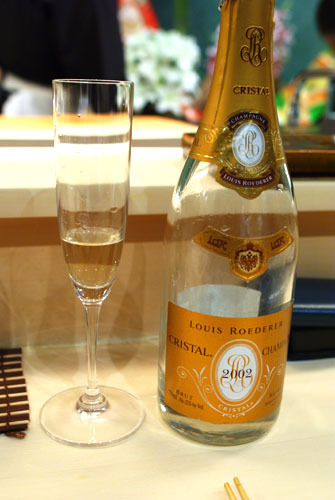 For our next potable, we decided to tap the 2002 Louis Roederer Champagne Cristal Brut. Though the wine was still quite floral and citrus-y, it was a bit more austere than I remembered, with a pronounced dryness backed by subtle toasty notes. Still very good--light and bright. 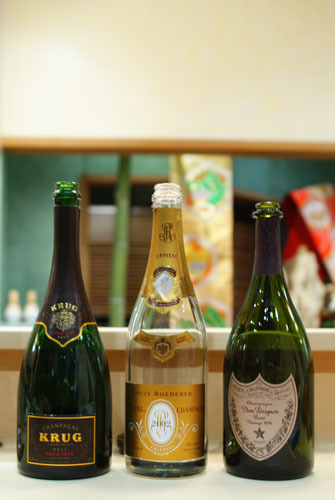 Note the different flute used here vis-à-vis the Dom Perignon and Krug; this was, I'm sure, due to the fact that the Roederer was a much younger wine (2002 vs. 1996/1995). 12. 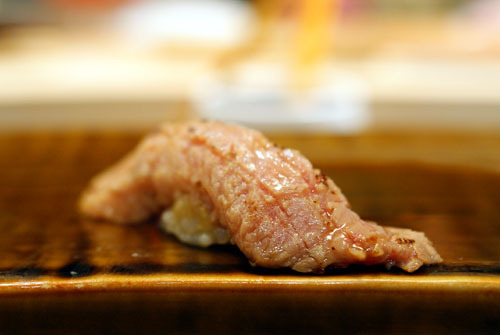 Seared Toro / Seared Fatty Tuna - Given how good the toro is, you'd think that you should just leave well enough alone. 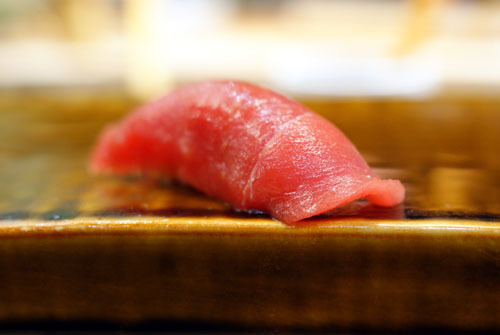 However, lightly searing the tuna yields wondrous results, making the fish even more unctuous, even more profound, with the taste of the char contrasting beautifully with the toro's natural succulence. 13. Kanpachi / Amberjack - Flavor-wise, the kanpachi wasn't terribly distinctive--clean, mild, and nicely accented by the wasabi. What wowed me here was the impeccable texture, a stunning combination of snap and yield. 14. 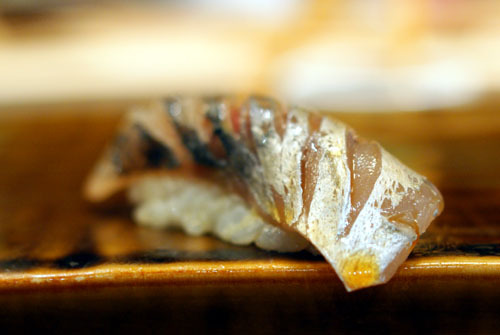 Aji / Spanish Mackerel - Aji's arguably my favorite sushi fish, and this quintessential example merely reinforced that notion. The flesh was firm, a satisfying chew, while the taste was very fine, not fishy at all. Note the lovely scoring of the skin. 15. Tai / Snapper - From Kyushu island comes this belly of tai. Snapper is a fitting nomenclature for the fish, given its snappy texture! Truly a paragon of tai, the combination of soy and sudachi was perfect, and note the crosshatch pattern on the fish's top surface. Hiro-san and tuna: a winning combination. 16. Hon Maguro / Bluefin Tuna - Regular tuna can be a bit boring, but this was just about the softest, most buttery piece of maguro I've ever had, more buttery than many pieces of toro I've eaten in fact! In terms of taste though, it was very mild, so the texture was key here. 17. Shima Aji / Striped Jack - On my May 2008 visit, the shima aji was my favorite piece of sushi, and though it didn't reach quite the same lofty heights this time around, the shima aji was nevertheless quite tasty, with a light, refined flavor accented by a sharp wasabi finish. The best part about the fish was its firm, crisp texture. 18. 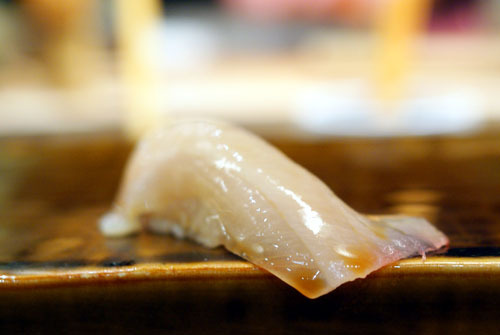 Ika / Squid - From Japan comes this creamy, palate-coating squid that gave my mouth quite the workout. 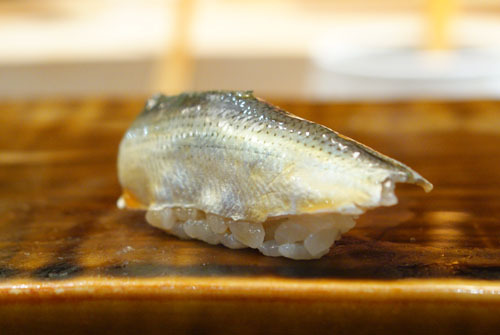 Taste-wise, the ika was subtly sweet, aptly accented by the grated sudachi and salt. 19. Shiitake / Mushroom - I've had shiitake nigiri on every visit here so far, yet Urasawa remains the only place where I've seen it done. 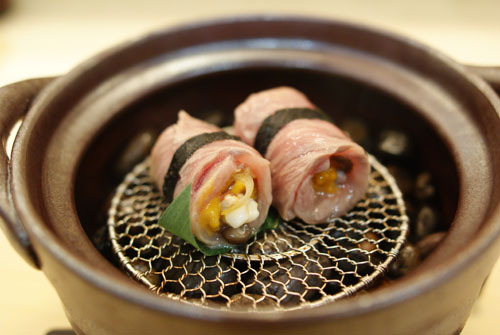 The preparation really brings out the smoky, woody, earthy nature of the mushroom, balanced by the rice and wasabi. 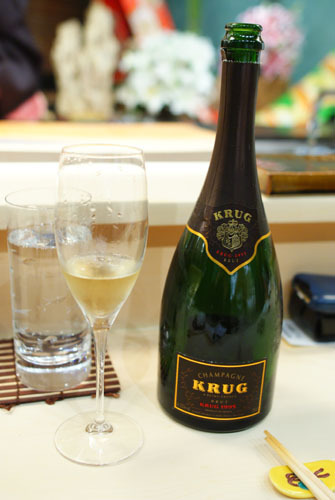 Our final bottle was this 1995 Krug Champagne Brut. I noted a bit of citrus on an otherwise oaky nose, but on the palate, this was quickly overcome by intense notes of caramel, toast, and stone. Brazenly dry, with a silky body, laser-tight focus, and a protracted, prolonged finish. 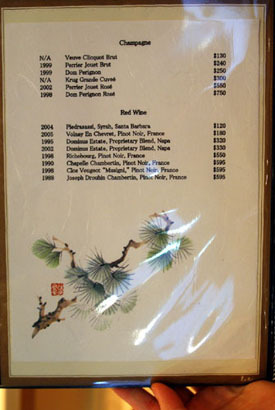 Very typical of the Krug style, and reminiscent of the 1990 I had at Sasabune. 20. 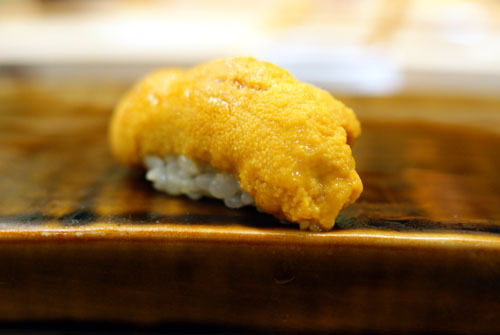 Uni / Sea Urchin Roe - I must say, this was some of the best uni I've ever had. 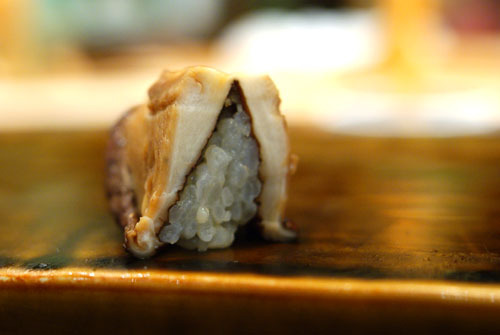 Delicate, sweet, and super-creamy, it was a model of what sea urchin should be. And the wasabi kick at the end? Beautiful. It even managed to convince James, who'd previously had an uni aversion. 21. Chu-Toro / Medium Fatty Tuna - I've had plenty of toro and plenty of maguro at Urasawa, but amazingly, this was the first time that chu-toro was served. 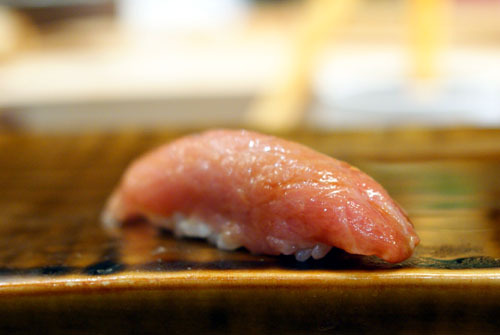 As expected, it had a richer, fattier flavor than the standard tuna, though it obviously wasn't up to the level of toro. 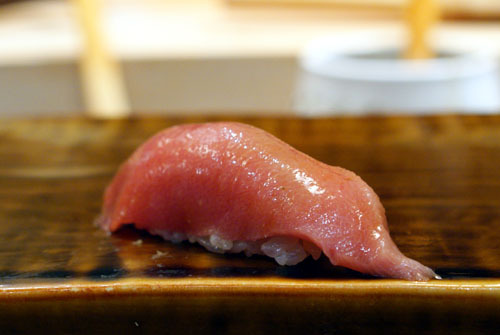 What surprised me however was that the texture was a bit more unyielding than the standard hon maguro. 22. 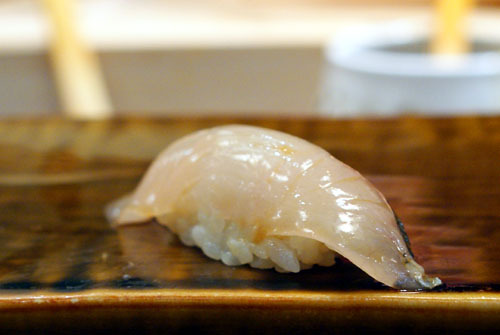 Shiro Ebi / White Shrimp - Urasawa remains the only place where I've been served nigiri made from shiro ebi, small white shrimp gathered off the coast of Toyama Prefecture. Given their small size, about a score of shrimp was needed to construct a single piece of sushi, and the mass broke apart instantly upon mastication. Their flavor was mildly sweet, and very creamy, with a gelatinous body. 23. Awabi / Abalone - From Japan came this abalone, with a subtle sweetness that was perked up by the application of tangy grated sudachi and fiery wasabi. Texturally it was firm, though somewhat supple, not overly crunchy. Note the scoring on the surface of the awabi. 24. 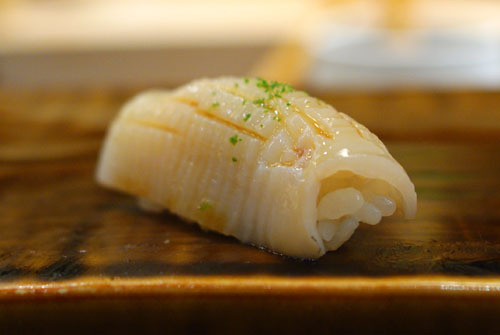 Mirugai / Geoduck - The award for crunchiest item of the night would be taken by this mirugai, a.k.a. giant clam or elephant truck clam. It was a very pleasing crispness though, not tough at all, but satisfying. In terms of flavor, it had an intense, briny smack, backed by a bit of sweetness. 25. Toro / Fatty Tuna #2 - At this point, Hiro-san asked us if we'd like more toro. The correct answer is, of course: "yes please!" It was much the same as the previous one: scrumptious. 26. Kohada / Japanese Gizzard Shad - Kohada is also known as Japanese gizzard shad, or Japanese herring as Hiro-san likes to call it. 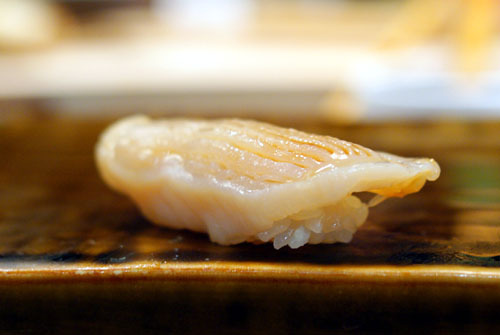 It was an oily fish, with a strong yet slightly sugary taste, lovely skin, and a uniquely firm consistency. Quite nice. 27. Negi-Toro Maki - Containing chopped toro, negi (leek), and takuan (pickled daikon, which aids in digestion), this is just about the only maki roll you'll see at Urasawa. What struck me was the texture of the pickle, which gave the roll a wondrous crunch and sour flavor. The leek, meanwhile, providing a bracing tang that tempered the lavishness of the toro. 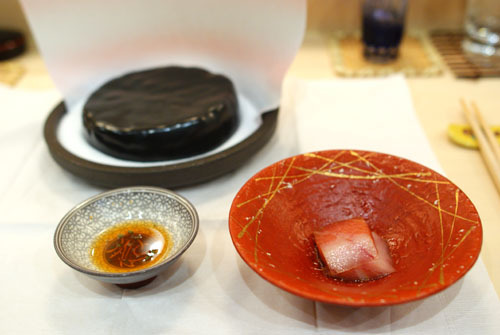 The roll is shown here sitting in soy sauce. 28. 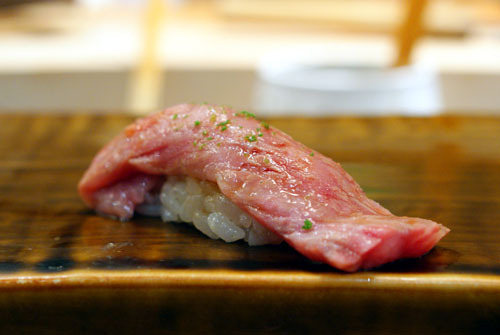 Gyusashi / Beef - Of the nigiri, the gyusashi is one of the ones that I look forward to the most. It didn't disappoint this time either, with an incredible beefy sumptuousness balanced by the mitigating tang of citrus. One of the tastiest bites of the night! 29. Uni / Sea Urchin Roe #2 - Another round of uni. What happened was that Hiro-san accidentally got more uni than he needed, and thus had to "get rid of it," which was fine by us! I've only had Santa Barbara uni on my previous visits, so it was nice to have the Hokkaido version this time, considered the finest in the world I understand, with a season running from May to October. What I'd really like to do is compare Santa Barbara and Hokkaido back-to-back and see if I can discern a difference. Hiro-san then surprised us by bringing out live shrimp from tanks beneath the counter. Here we see him and Ken-san breaking them apart. 30. 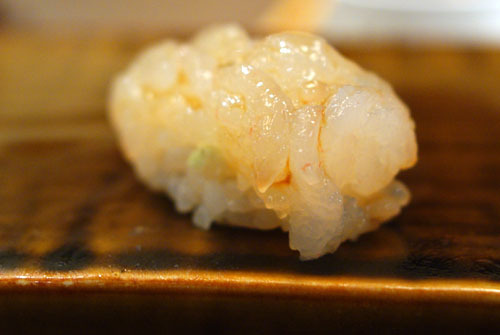 Amaebi / Sweet Shrimp - This was pretty much the acme of amaebi: sweet yet briny, creamy yet crunchy. It was heightened by the use of a sauce made from the shrimp's innards, which gave the amaebi a distinctly sweet-metallic tinge. One of my dining companions called it the best amaebi he's ever had, and I can see why. 31. 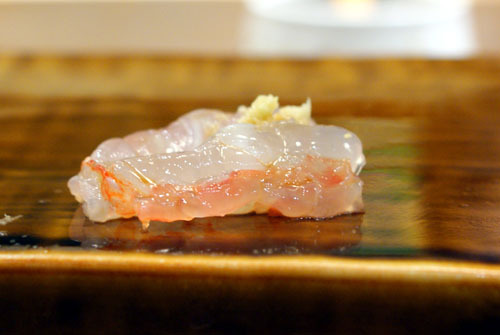 Amaebi Sashimi / Sweet Shrimp Sashimi - Here's something I didn't know: at Urasawa, you can request sashimi versions of the nigiri sushi, as we see here. Instead of entrails sauce, the amaebi is accompanied simply by a dollop of wasabi. The end result is a very different experience than with the sushi: the texture was even more apparent in this case, and the flavor was much milder, with the sweetness accentuated. 32. 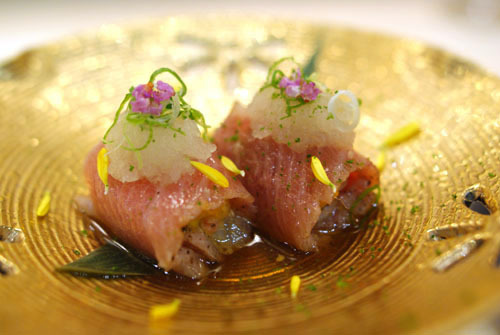 Aji No Tataki / Chopped Spanish Mackerel - Here we have another item that I've only seen at Urasawa--an amalgamation of chopped aji, Kyoto miso, scallion, shiso, and ginger. This is one that I always look forward to, as it has a great base of aji to begin with, which is then accented by the sweetness of the miso and the invigorating savor of the shiso-scallion-ginger complex. Excellent. 33. Chu-Toro / Medium Fatty Tuna #2 - Our second round of chu-toro here. Think of a fattier maguro. Delish! 34. 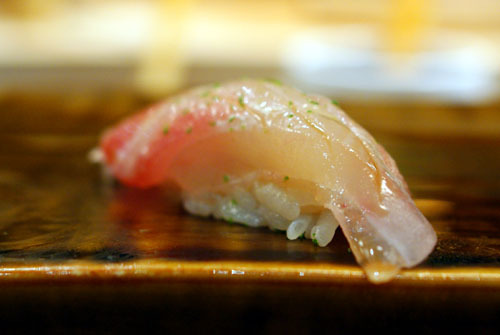 Shima Aji / Striped Jack #2 - Compared to the first, I liked the texture of this one even better. 35. 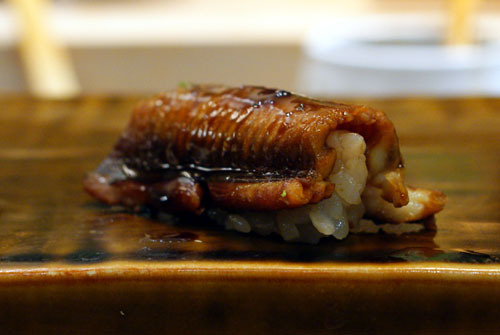 Anago / Sea Eel - I usually tend to favor unagi over anago for its more unctuous nature, but this version would give unagi a run for its money. It was suitable fatty, suitably lush, and well-accented by the included sweet sauce (we told the newbies that it was chocolate sauce!). I think this might've been the best anago I've had yet at Urasawa. 36. 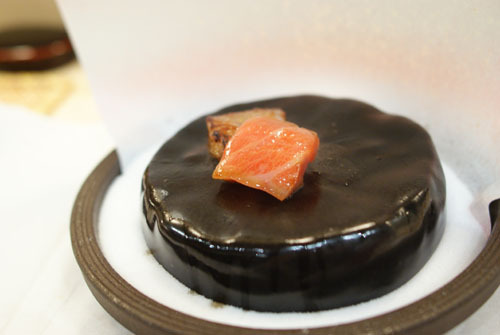 Tamago / Egg - Unlike most places' tamago, the example here resembles a cake more than an omelet, perhaps even resembling datemaki in that regard. Dense, heavy, and moist, its flavor was an intriguing interplay of sweet and savory. 37. Peach Gelée - And with that, we were on to desserts. 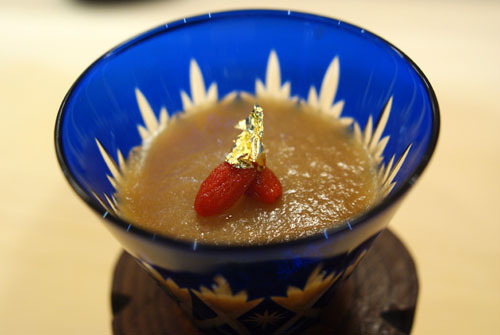 The first was this gelée of peach, topped with goji berry (a.k.a. wolfberry) and gold foil. The gelatin had a surprisingly unyielding consistency, and a taste that was like eating liquefied peach. Chunks of the fruit made for a nice textural variation. 38. Goma Aisu Kurimu - Urasawa's sesame ice cream always satisfies. We asked Hiro-san what was in it and he responded that soy milk, cream cheese, and honey were used. No matter, the result was an ice cream absolutely infused with the pure quintessence of sesame. I wish I could take a pint or two home! 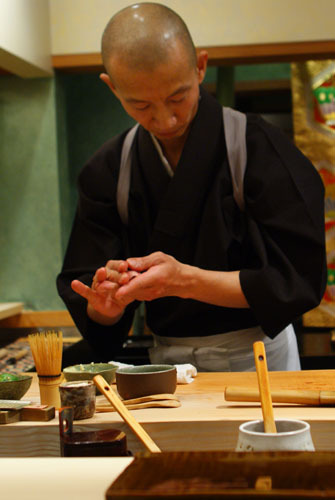 Using a chasen, Hiro-sans whisks up some matcha tea to serve with the desserts. Note the decorative place mat employed; does it carry any significance? 39. 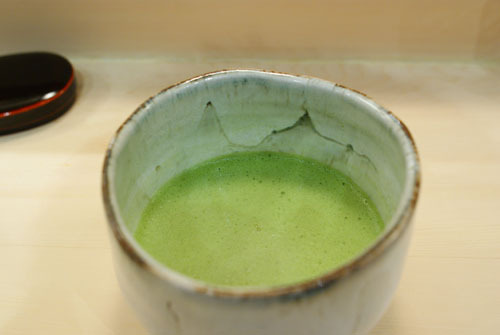 Matcha - Matcha is a variety of powdered green tea, often used in Japanese tea ceremonies. The tea's texture was frothy, gritty, and grainy, with a strong, bitter flavor that cut right through the sugariness of the desserts. 40. 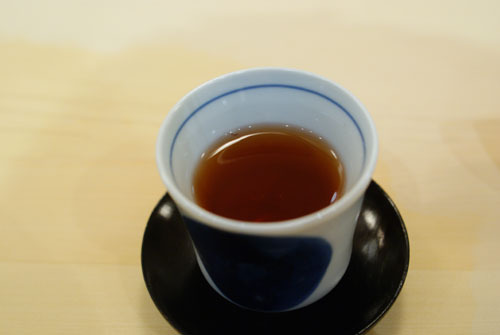 Hojicha - The second tea was a roasted green tea. Mild and easy-drinking, it was a nice way to close out a meal and Urasawa, and I always find myself having multiple cups of it. As has become Urasawa tradition, we now present the sum of the night's damage. Though not as heinous as last time, it still came out to $500 per person. What can I say about Urasawa that hasn't already been said? Though this is now my fifth visit, I can say that the place never disappoints, and that I look forward to and treasure every meal I have here. James described the experience as a "symphony of food" in terms of a progression of flavors, and I think that the phrase sums things up nicely. During the meal, Hiro-san and I discussed how the vaunted Michelin guide was leaving LA, and the reasons behind the move. Urasawa may never get its third star, but if there's any place in the City that deserves it, this'd be the spot. Superb account as always. I'm happy you don't get jaded with Urasawa after eating there so many times! excellent review as always! 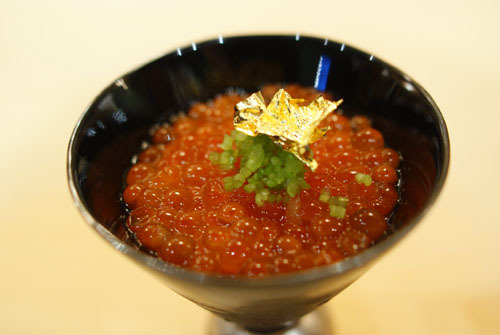 the wagyu-caviar-uni combination puts the L in luxury! 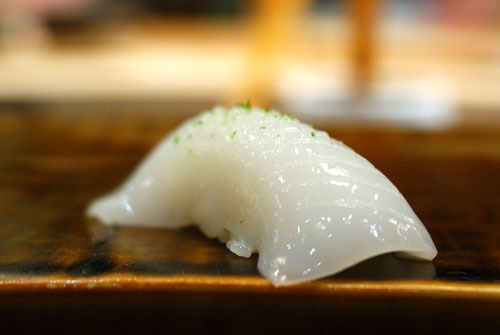 does the chef always ask if you want round-2 nigiri? and i am curious about why there won't be LA Michelin guide in the future... any insight? im.pressive. meal, review & pics! I can't believe you've been five times. I haven't even been once. 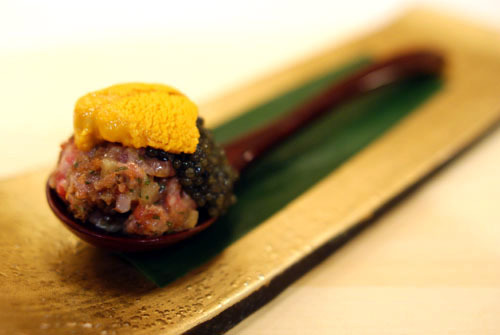 The Wagyu tartare topped with uni looks insane! Kevin - It's outrageous that you've been to Urasawa five times. Simply outrageous. Loved the photos! Love the pix. They're making me drool at work! Amazing dinner and pics...I wish I went to this trip. It looks like you guys got more food this time around compared to trip #4! Can I just reserve a seating now for your 6th trip to Urasawa?? I'm down! If you ever go back to Go's Mart, you can try the two uni's side by side. 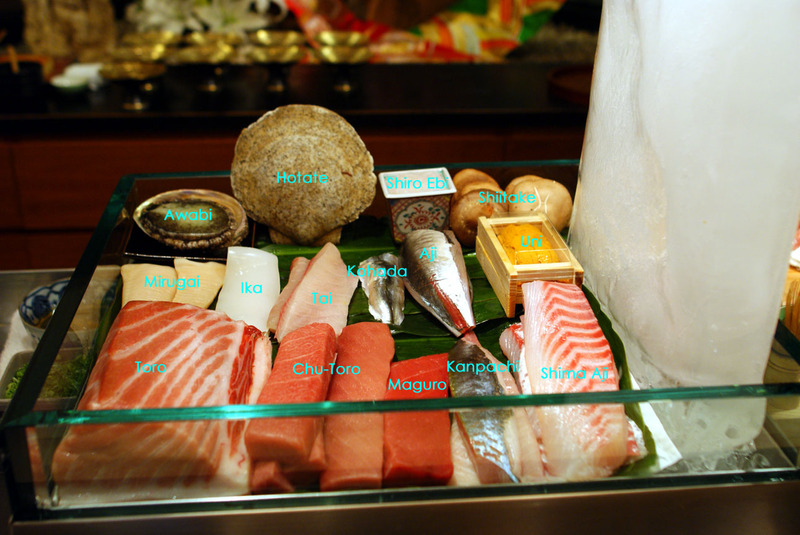 I only do omakase there and was served it a few times. 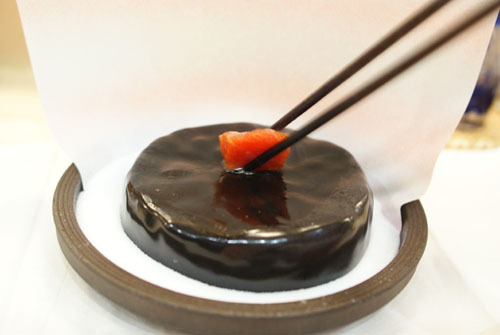 Ichigoni is a tranditional summer cusine around Sanriku Coast, typical ichigoni are cook with sea urchins and abalones, and classfiled as a Stock (吸物)- any most dish serve with liquid falls in this. It was name Ichigoni(wild strawberries) because the sea urchins cooked in hot water look like wild strawberries. Urasawa version simply add shark fins to it to make it more upscale. Once again, nice post, looking forword meeting you on next Tue. http://www.ichigoni.com/sticking-to/how-to-eat.html, show you different version of Ichigoni. Kevin, curious to know if the other seats in the restaurant were booked. Is there a correlation of getting offered seconds when there are no other guests there? It's also interesting to note that the bill has gone from 275 pp to 300 to 350. And how do you handle the final bill? Split it 10 ways on 10 different cards? I was with you right up to the shark fin. You lost me, and my respect, at that point. So does he Hiro-san switch between Saga and Kagoshima beef? 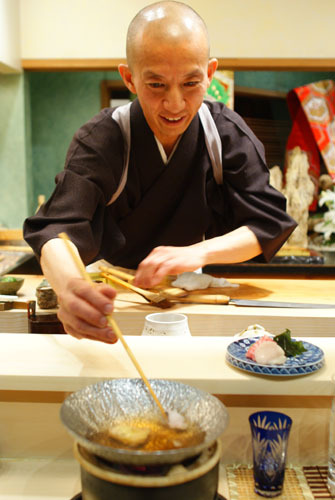 Couldn't get him to do the pure kaiseki meal? What was the "marinated seafood" in course 5 marinated in? Did he use the eel knife for the eel? Nice description of "snap and yield" for the kanpachi. You know how important mouth feel is to me. This is to help you answer Arron Q.
Usually,Ichigoni are in soup form, but in other to do it as Urasawa's marinated version, which required a three additional step - 一番出汁, 二番出汁. 一番出汁 - To simply put, keep cooking the "main"(Uni, Awabi, Fukahire) Ichigoni ingrendence until all favor come out (stock), filter keep the liquid. Save the ingrendence for later. 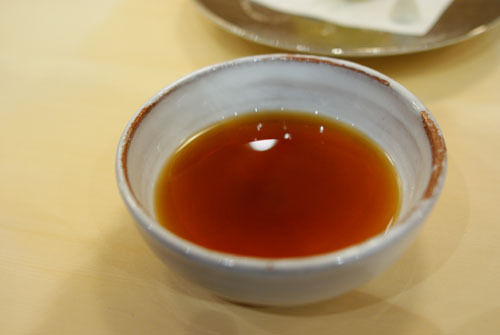 二番出汁 - Repeat the step one by using the filter liquid with fresh "main" ingredence. Once finish, use the filter liquid and add the save ingredence from step one and two, keep cooking until the liquid turn into a highly concentrated reduction. Serving - Use the filter reduction from step two to cook the Ichigoni "normally" with fresf product ("main" and whaterver else it call for) according the regional style that you choose, with bare min. amount of the just to cover the product. Due to the highly concentrated "reduction", the ingerdence will marinated itself during the finial cooking process. Jai: I'm excited for you man. Do report back on your experience. Proocol Snow: Yep, Urasawa's one of the few places that always delivers for me! 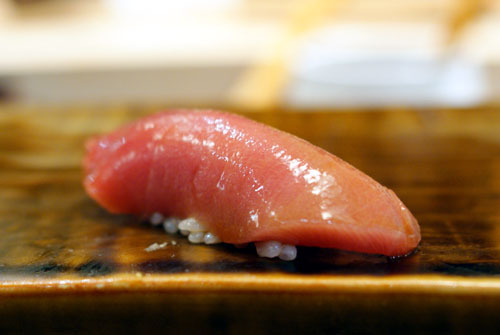 Rich: I don't believe Hiro-san always asks about round 2 nigiri; I think it depends on how much produce he has left. As for Michelin, I think the economics simply didn't justify it. Jack: Thanks Jack. So when are you going to start up your blog again? Jo: I'm surprised you haven't been yet! Cathy: Thanks! So when can we expect a report from you? Danny: Ok, I have you down for round 6.
sygyzy I do need to make it back to Go's. I take it that both types aren't regularly available simultaneously though correct? Dason: Thanks for the info. I've incorporated the ichigoni into the body of the review. Charlie: We were originally thinking about the '96, but went for the '95 simply because it was considerably cheaper, and of comparable quality. Dan: Actually, the table was booked by a young couple and their toddler daughter. I've noted no correlation between seconds and the number of people, but then again, I haven't really been explicitly keeping track. As for the bill, they've had no problem splitting it ten ways. Kim: Please, get off your high horse. Jay: The way Hiro-san explained it, it sounded like the revenue from the LA guide didn't justify the expenditure it took to produce it, especially in the current economic environment. It's a shame really. 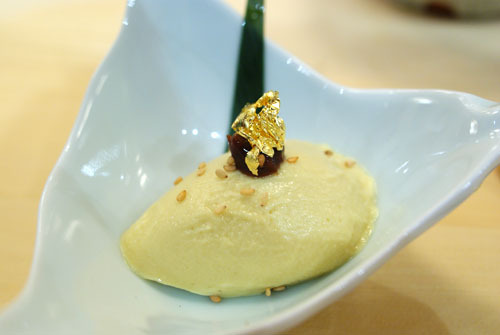 Next time you're in NYC, are you going to dine at Masa? I'd love to see side-by-side comparisons! i've had the 96 as of two weeks ago 3 times in the last year. HUGE bottle variation. I have friends who rant and rave that it's the greatest champagne known to man but each time I've had it, it's been very austere or closed. 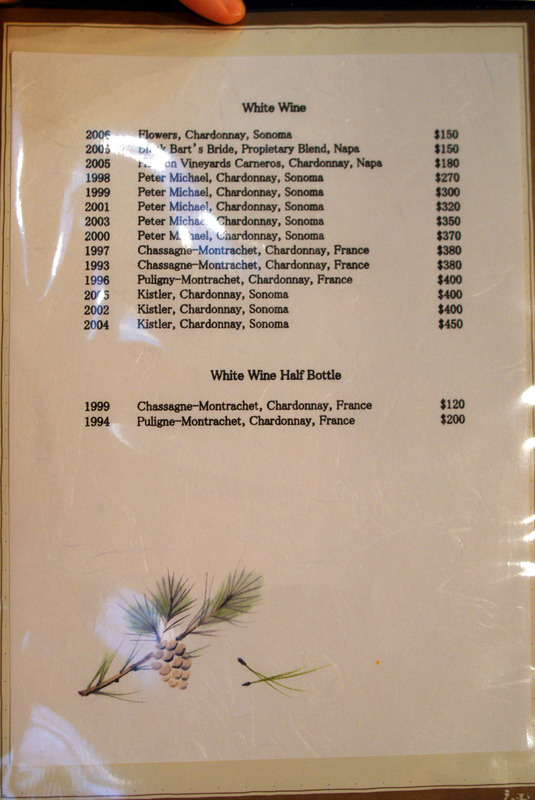 Krug: 1995 Clos d'Ambonnay, average $3400. 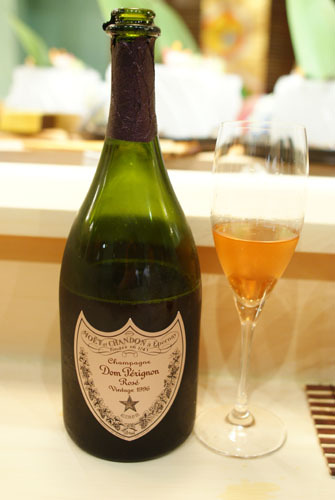 Dom Perignon: 1998 Jeroboam average $1800, or if you have money to spend go for 1995 Jeroboam with a $35000+ price tags. Kevin! I dropped by to see if you wrote up about your most recent Urasawa visit.. and you did(I'm pretty sure the food tasted even sweeter being gratis)! 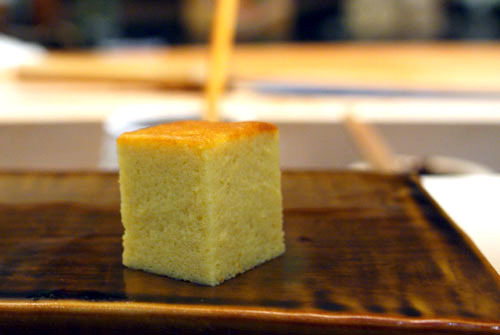 The tamago is def reminiscent of pound cake. Looking forward to a sixth review in the future. Jai: I'm afraid it's a no-go on Masa, as he doesn't allow photos. Also, how did the meal turn out? I heard somebody paid for you; what was the occasion? Charlie: I've not had the '96 yet. Perhaps it just needs more time? Dason: Those are some great Champagnes, but I don't see the need for the super-sized bottles! Ivy: See what you missed out on! I haven't heard from you in a while; what have you been up to? Mia: Anyone can go to Urasawa. Or do you mean with me? It's definitely more fun to go with a larger group. I guess you just have to get to know me better! Oh my Kevin--All those pictures made me drool big time. I've heard great things about Urusawa, and I'm hoping that one day I will be able to afford the experience, but for now I will live vicariously through your article. Thanks for that. 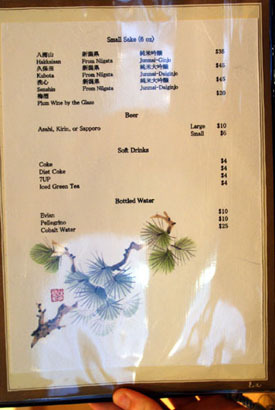 As far as I can tell, Urasawa seems to be your favorite restaurant in all of Southern California. I just received the 2010 Southern California Zagat Guide, and they rated one restaurant above all others in SoCal called Tabu Grill in Laguna Beach at a 29/30 rating. No other restaurant in the current guide including Urasawa matches it. I, frankly, am amazed! Zagat looks like it's becoming more and more irrelevant. There's no way that Tabu is the best restaurant in all of SoCal. Just look at the menu! I agree with you on Zagat's irrelevance, but what about the Michelin Guide? Have you heard of Jinpachi? I have never been, but heard they have great sushi. 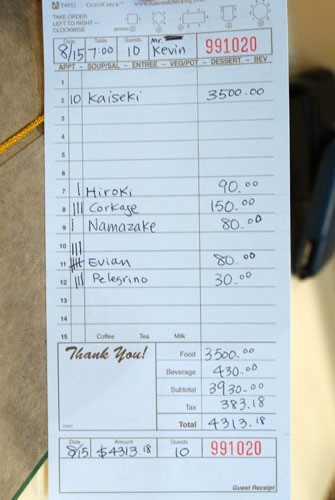 And how do you get reservations at Urasawa? I do like Michelin a bit more, as they're based on "professionals." Certainly though, they're not perfect either. I have heard of Jinpachi; I've heard good things in fact. 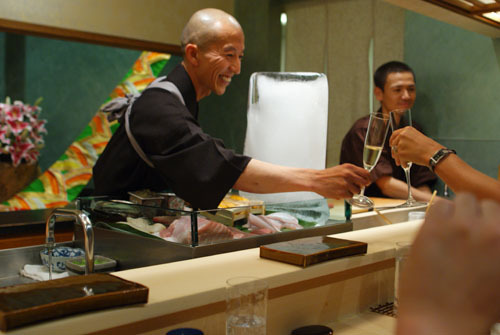 And as for Urasawa, just give them a call; it's not hard to get reservations with a few week's notice. is the four generation successer, it's worth trying. when did the price go up to $350pp? Daniel, it was $250 my first time too. Then it was $275, $300, and $350 on my fourth and fifth visits. To visit Urusawa once is a rare treat, but 5x? You are a baller!!! 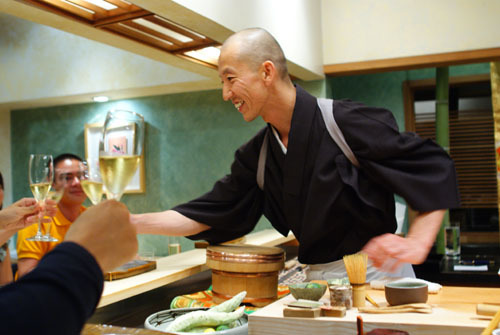 I was told by Hiro when I went that his restaurant is not kaiseki, is he merely being humble?? 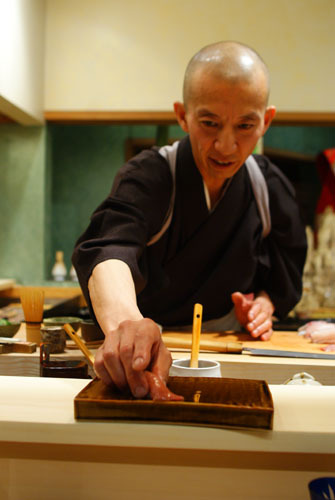 Though Hiro is humble, he is right if we assume a strict definition of what kaiseki entails--2/3 of the meal would not be sushi in a traditional kaiseki meal. I generally use a looser definition of the term when describing meals at Urasawa though. Sorry if I missed it, but have you been to Sawa? It's the only other sushi place in Cali that I see referred to as the best. I've seen many reviews of both, but no outright winnter. I'd love to read your thoughts on which is actually the better spot. Rod, unfortunately I haven't been to Sawa. I am familiar with the place though. I would wager that the difference in ingredient quality is perhaps minimal. The overall experience at Urasawa, though, seems more "special" from what I've seen. I have a question regarding sushi fish. Now I have read that FDA requires all fish served raw to be frozen at one point to kill parasites, either frozen by the supplier or at the restaurant. They don't enforce it though. I was wondering if the fish Hiro-san serves is frozen at some point. It might be a bit sacrilegious to ask but...for curiosity's sake! Zaw, your budget will expand once you get out of school and start working. ;) My interest in food first started in undergrad, but really blossomed once I could afford to eat out at nicer places more often. Good question about the fish. I imagine that some of it must've been frozen somewhere along in the process. I've not specifically inquired though. Per FDA requirnment, in order for restaurant to serve "raw fish", it need to ether "flash freeze" at −31°F for 15hrs, or store in a −5°F freezer for 7 days. According to the supplier I use for sushi grade product, they said it is a commone pratice if the product are label "fresh", it means it use "flash freeze", if it lable label "previous frozen" or "frozen" mean it use the "7 days method". The reason it able to call fleah is because flash freezing able to freeze perishable food items fast enough that large ice crystals cannot form and damage the food cell membranes. Since Urasawa have most of his product ship from Japan (most likly from the fish market the night before and there's no "freezeing" regulation in Japan). You can pretty much bet on the fish market have the product "flash freeze" before shipping, so by the time it reach US, he will able to use it right away. Opps,, I forget to mention, somehow live fram raise shellfish are excude from the regulation. Yep, I would guess that what you wrote is the case at Urasawa. Went to Urasawa this week. Major gigantic disppointment. I expect a lot more from a place charging $ 600 a person. I first learned about URASAWA thru your blog and my husband and I are finally going tonight. Have you been recently? They don't allow photos to be taken anymore. That's really weird. If we're going to be paying that much $$$, why are we not allowed to document our experience? Would you know why? They allow photos of people, just not the food.